Join the discussion on our forums! Come discuss Bog Slosher over in our dedicated Bog Slosher discussion topic. Battlecry: Return a friendly minion to your hand and give it +2/+2. It's the bane of freshly mopped floors everywhere. The poor man's Zola the Gorgon. Now I can finally play this gross Shudderwock deck. Staple in any Elemental Shaman that pops up I'm sure. Good body, good effect, good card. I'm thinking something along the lines of a handbuff use for this card, something along the lines of Saronite Chain Gang and Doppelgangster, but I couldn't find a proper home for this card. 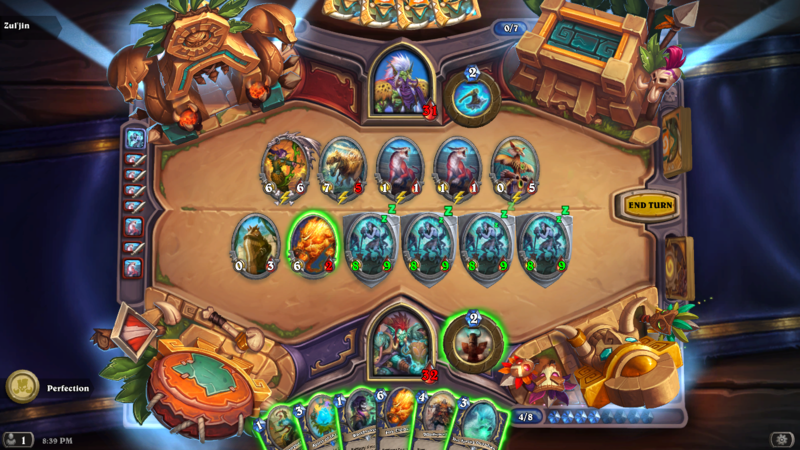 Shudderwock pretty much only relies on Grumble bounces to consolidate its win condition, and this might be a trivial addition to that combo. Maybe I'm wrong and I don't see the insane combo some people seem to imagine. You play it on a minion after you've traded with it. It's not really much of a tempo loss in that situation and you more than gain it back from the +2/+2 stats. How long can this slosh on? 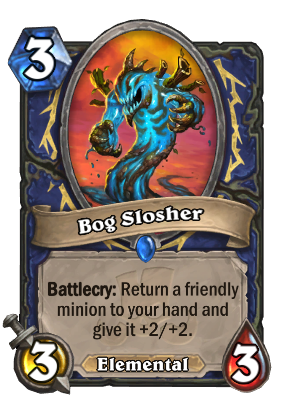 This may see play in Shudderwock Shaman after the other cards rotate, but even that's a bit optimistic since there's still no way to duplicate Shudderwock without the Saronite Chain Gang . Seems absolutely insane. Probably a new card for OTKs. Extremely strong, a lot of great combos.. He can drink Youthful Brewmaster under the table. It looks like Venom drank too much blue Powerthirst. So the basic combo is: Turn 2 Menacing Nimbus, Turn 3 this, Turn 4 Menacing Nimbus 4/4. More like Youthful Brewmaster on steroids. Another good battlecry for shaman. Also, shamans tend to trade pretty well on board so bouncing stuff back will increase value they have. Elemental synergy too. Shaman is loved again.